Alopecia areata (AA) is an autoimmune disease, which targets the hair follicle, leading to hair loss in different regions of the body. It is known to have a strong genetic basis, but environmental factors probably play a role in its initialization. This assumption is supported by twin studies, showing 42–55% concordance rates in monozygotic twins., We describe identical twins with identical AA appearing simultaneously in two different occasions. 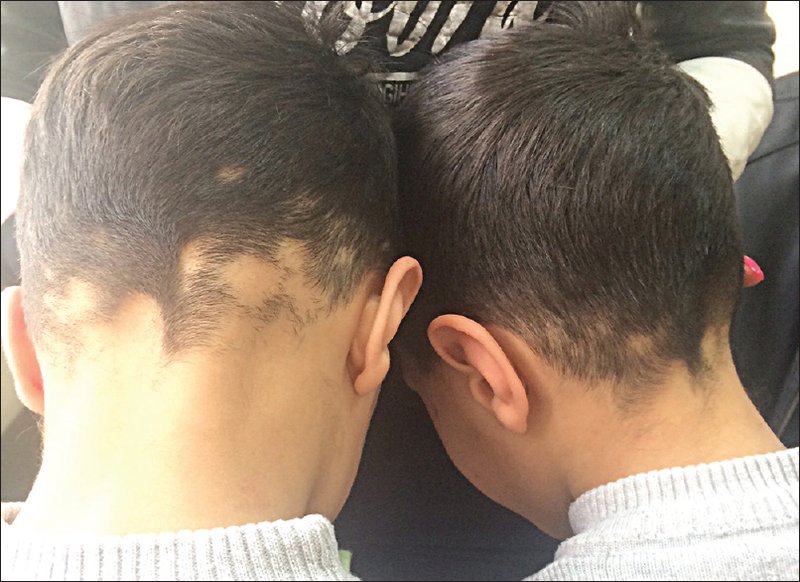 A 6-year-old identical male twins had an episode of localized hair loss on the scalp, which appeared simultaneously. The hair regrew after local corticosteroid treatment. One year and 2 months later, one patient experienced an additional episode, with loss of hair on the posterior scalp, followed by the second twin 2 weeks later. Treatment with topical garlic was not successful in both patients. On examination, coalescing patches of hair loss were evident on the occipital scalp of the two patients [Figure 1]. No other skin lesions were seen. The prevailing theory today on the etiology of AA supports the role of genetic predisposition with contribution of still unknown environmental factors., Since other autoimmune diseases may be influenced by infectious pathogens, viral, and bacterial infections were also suspected as potential triggers of AA. However, the infectious etiology in AA is still under debate, and several studies did not find a correlation between viral infections and the appearance of AA., Our patients, being part of the same household, were obviously similarly exposed to environmental triggers such as infectious pathogens. However, detailed history did not reveal any clinical signs pointing at an infectious agent as a potential trigger. It is of interest that the two twins described had involvement of the same area of the scalp, forming an ophiasis pattern. Previous reports also described a similar pattern of hair loss in identical twins. This observation raises the question whether genetic factors can also influence the type or localization of AA although this assumption should be further assessed by larger cohort studies. AA appearing simultaneously in identical twins has been reported only rarely in the medical literature, with only four cases described to date. Taking into consideration the importance of the genetic factor in AA, it is surprising that such cases have been reported so sparsely. The present case is unique since it reports on two episodes of hair loss that occurred simultaneously in identical twins. McElwee KJ, Gilhar A, Tobin DJ, Ramot Y, Sundberg JP, Nakamura M, et al. What causes alopecia areata? Exp Dermatol 2013;22:609-26. Biran R, Zlotogorski A, Ramot Y. The genetics of alopecia areata: New approaches, new findings, new treatments. J Dermatol Sci 2015;78:11-20. Jackow C, Puffer N, Hordinsky M, Nelson J, Tarrand J, Duvic M. Alopecia areata and cytomegalovirus infection in twins: Genes versus environment? J Am Acad Dermatol 1998;38:418-25. Rodriguez TA, Fernandes KE, Dresser KL, Duvic M; National Alopecia Areata Registry. Concordance rate of alopecia areata in identical twins supports both genetic and environmental factors. J Am Acad Dermatol 2010;62:525-7. Dogra D, Sood A, Khaitan BK. Alopecia areata in identical twins. Indian J Dermatol Venereol Leprol 1996;62:199.